If you are like most of us there is a box of photos, slides and memorabilia under the bed or in a closet corner fading away. The memories inside are pure gold! 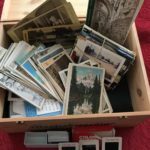 A professional photo organizer asks you to inhale and remember, “A box of photos tells no tales.” It is probably (past) time to think about organizing and saving those photos, slides & stories. Organizing your photos is a personal process. Most often you organizer work one on one time. During this time meetings can be conducted in person or remotely. Curating your photos means we are preserving high-quality photos that tell your or your family’s story. The photo organizer will help you collect your story thoughtfully. Next: easy searchable access to your pictures. This is done by the use of keywords dates and tags that will allow you to find a photo quickly and simply. For example a birthday party from 1981 would have the DATE of the photo, a TAG that would say birthday, a TAG TO INCLUDE celebrants name. If others are in the photos the keywords would include those persons names. It is possible to conduct this sort of organization once photos have been sorted. The same sort of system can be used with digitally stored photos. A photo organizer will also help you back up your photos so that they are are available in case of a disaster. They will advise you to how to store your photos safely and securely so that they are not being damaged by the containers or albums they are in . A professional photo organizer will advise you about archival storage options. Other suggestions may include cloud-based storage for your images. Be sure to talk to your professional organizer about options for viewing and using your copies of your photos in a variety of different formats and materials. Isn’t it past time to schedule a consultation with one of these professionals? A photo organizer assures your photos, history and memories can be enjoyed time and again for generations to come. No gift or souvenir will mean more to future generations than the time you take to create a lasting legacy. View the complete list of services to get started today!